high school, only a crow was cawing away into the evening. stomachs as if they were plastic bottles. him, so I ran. If he came back, I would ask, “What moon? our brains were not yet ready to grasp. But that is not the point. was fishing for me with its own little moon as bait. 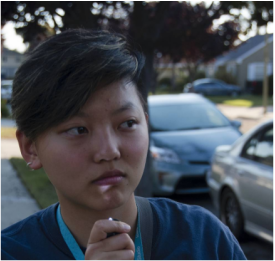 MARGARET ZHANG is a senior at Castilleja School (Palo Alto, CA), where she appreciates memes and serves as the Editor-in-Chief/Co-Founder of Glass Kite Anthology. She has attended writing workshops at the Iowa Young Writers’ Studio and the Kenyon Review Young Writers Workshop, among others. Read her other work in DIALOGIST, Gigantic Sequins, Words Dance, Cadaverine, the Foyle Young Poets Anthology, and other journals.